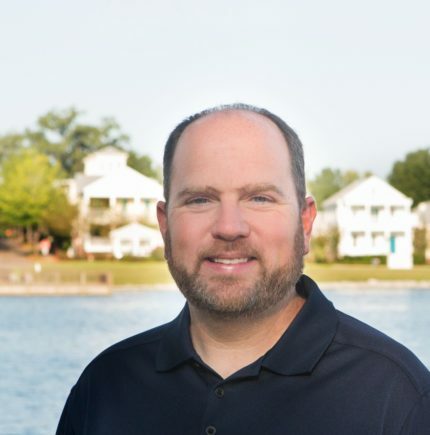 Jeff Dickey began a career in Real Estate and joined the New Waters Realty team in 2014. With many years of experience in business administration, digital marketing, project management, creative planning and organizational leadership, Jeff quickly became a top producer in the area and a leader in the new construction market. At NWR, Jeff is a Realtor, Associate Broker and Team Leader for the New Home Sales Team at The Waters in Pike Road, Alabama. He is a writer for Porch to Porch, a monthly publication for neighbors at The Waters. As a native of Montgomery, Jeff has lived in the area except for his time at Troy University where he graduated with a degree in Business Administration. Jeff began his professional career as a Warranty Claims Analyst with Rheem Manufacturing Company – Water Heater Division before accepting a summer position in Youth Ministry at Heritage Baptist Church that lasted 7 years. He served an additional 8 years at Heritage as Church Administrator before the transition to Real Estate. He lives with his wife Claire, children Clayton & Arden as well as their chocolate lab Hershey at The Waters in Pike Road. Serving in the community is important to Jeff as he is a very active member of Century Church, on the Board of Directors for NICU Footprints Ministry, the PTA Board at Pike Road Elementary School and various committees with the Montgomery Area Association of Realtors. He oversees LifeGroups at Century Church, serves on the Leadership Team, Connection Team, with Century Kids and is a vocalist in the worship band. Out of many proud and grateful moments, there are a few that stand out – the day I married Claire, the birth of my son, Clayton and the birth of my daughter, Arden…and of course that day when I picked up my dream car, a bright red Nissan 240SX that my parents bought for me after getting a full tuition college scholarship. The ability to make more hours in the day! Ends with the realization that tomorrow when I decide to wake up, I have no plans, no agenda and no where to be.